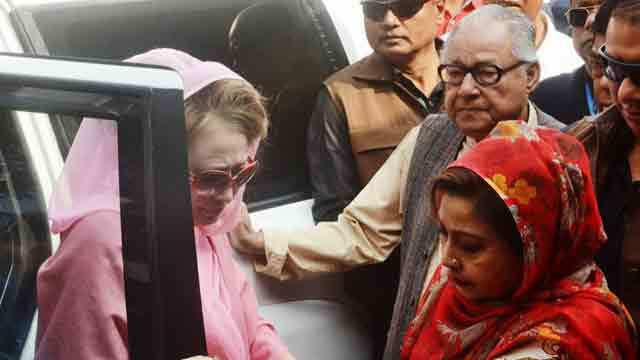 Dhaka, Jan 31 (Just News): BNP senior joint secretary general Ruhul Kabir Rizvi on Wednesday alleged that a huge number of police, including plain-clothes ones, were deployed in front of their chairperson's Gulshan residence as the government has 'indulged in a dangerous game'. "We've got information that a good number of law enforcers, including those from the Detective Branch, have taken position in front of our party chairperson's Gulshan residence. We don't know the exact reason behind it," he said. Speaking at a press briefing, he also said the sign of the 'dangerous game' the government has initiated is getting clear with its action. Rizivi said the government is taking various repressive steps sensing its 'fall'. He also alleged that police arrested over a hundred leaders and activists of their party and its associate bodies on Wednesday on their chairperson's way to and from a special judge court at Bakshibazar in the city. Besides, he said, the law enforcers charged baton on their party men as they were returning from the court with their chairperson, leaving at least 50 of them injured. Rizvi said though they earlier booked International Convention City Bashundhara for their party's executive committee meeting on Saturday, the authorities cancelled it later following the 'pressure' from the government. He said they will hold the meeting at another venue the same day. "We'll inform it at the right time. The BNP leader said they will start distributing invitation cards to the executive committee members from Thursday to join Saturday's meeting.